Neural networks have propelled embedded vision to the point where they can be incorporated into low-cost and low-power devices. Embedded vision is becoming a topic of heated conversation thanks to the emergence of neural networks and their ability to make computer systems learn by example. Neural networks are a very different kind of processing element compared to the other kind of processors we have in the IP arsenal today in that they are not programmed in the same manner. They do not have a stream of instructions that define what data should be used and how it should be manipulated. Instead, neural networks are trained using a set of example patterns and then they provide the best answer for patterns seen while in operation that had not been seen in the past. In other words, they learn in a manner similar to the human brain and come up with a best guess. Computer vision has been performed and optimized on supercomputers for decades, but it is a very difficult problem. How can you algorithmically define what a cat looks like and how do you distinguish it from a dog? Simpler still, how do you perform highly reliable handwriting recognition? Over time algorithms were improved, but then researchers started looking toward neural networks and machine learning as an alternative way to approach the problem. Neural nets attempt to replicate certain aspects of the way in which the brain works. A neuron has a number of inputs, with each input having a certain weight. A non-linear function is performed within the neuron that produces an output that in turn feeds other neurons. Optimization of the network around the target applications can yield dramatic benefits in recognition rates and especially in computational complexity of both training and inference. “Neural networks, especially convolutional neural networks are dominated by 1D, 2D and 3D filter operations that are closely similar to the operations used for implementing filters on DSPs,” explains Chris Rowen, fellow at Cadence. 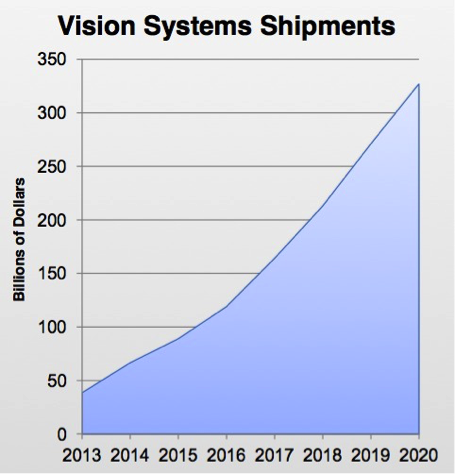 Source: Synopsys The embedded vision systems market is forecasted to be more than $300B by 2020, with a 35% compounded annual growth rate. Apple is getting into the action, as well, with apps that will recognize people in photos you take. Then they make it easier to share them with your friends. A new patent (20150227782) was published just a few days ago related to this. While they may not be able to retrain themselves, it doesn’t means that they cannot improve over time. “The object detection engine is programmable and has a specialized hardware implementation so that we get high efficiency out of it,” says Thompson. “We also have RISC CPUs attached to those. This is a full programmable environment and provides a significant compute capability that helps with TLD (tracking, learning and detection). We can run things like OpenTLD on the RISC processors.” OpenTLD is an algorithm and open source implementation for tracking of unknown objects in unconstrained video streams that does not make use of training data. Reliability also can be increased by using multiple types of sensors. A vision system in an automotive safety application may be using a camera in conjunction with radar. The radar is less susceptible to being fooled by tricks of the light, is more reliable at determining if there is a solid object in your path and how far it is from the sensor. However, it is less helpful in discriminating what the object is. The two together can potentially be more reliable. Will there be an “ARM” for neural engines?